The fast and easy way to create your own labels! 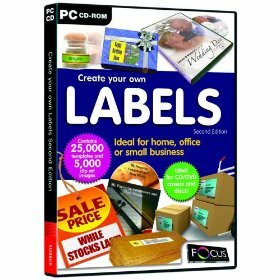 Containing 25,000 templates covering a wide range of label formats plus 5,000 clip art images, this program contains all of the tools needed to easily create business labels, personalise a CD or DVD as a gift, or even organise your home! All images are royalty free, and not to be used for commercial use. You may incorporate any image(s) into your own original work and publish, display and distribute your work in any media. You may not, resell, sublicense, or otherwise make available the image(s) for use or distribution separately or detached from a product or Web page. For example, the image(s) may be used as part of a Web page design, but may not be made available for downloading separately or in a format designed or intended for permanent storage or re-use by others. Disclaimer: Some of the images used on this packaging may not be included on this PC CD-ROM. All featured company names, addresses and services are completely fictitious and any similarity they bear to actual businesses is purely coincidental. Label templates for CDs/DVDs, files/folders, audio and video tapes, spice and herb jars, addresses, disks, name badges, luggage, shipping, raffle tickets and price tags! Digital camera compatible - add your own photos & scanned images! Step-by step wizard to help you lay out your label. Add graphic objects to your design - including incremental serial numbers, barcodes, logos, shapes and Text Art. A “Quick Edit” function to get your images to look their best. Save as JPG option for email attachments.